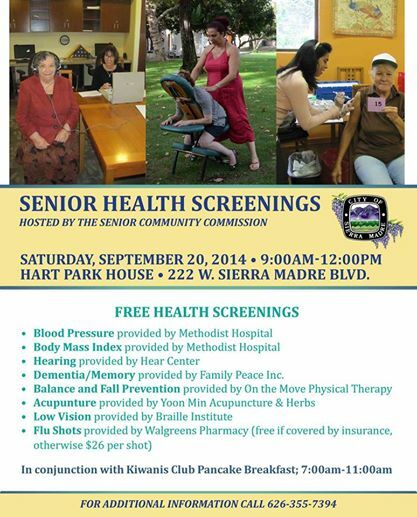 Press Release posted 9/13/14 – Saturday, September 20th the Senior Community Commission will be hosting a health screening event for individuals 55 and older. The event will be held from 9am-12pm at the Hart Park House Senior Center. Stop by and receive free screening services, including blood pressure, BMI, dementia/memory, hearing and more. Flu shots will be available for free if your insurance covers them, or $26 if not. For more information call 626-355-7394. The event will overlap the Kiwanis Pancake Breakfast, so you can kill two birds with one stone if you go between 9 and 11am.